The Canadair CF-104 Starfighter (CF-111, CL-90) was a modified version of the Lockheed F-104 Starfighter supersonic fighter aircraft built in Canada by Canadair under licence. It was primarily used as a ground attack aircraft, despite being designed as an interceptor. It served with the Royal Canadian Air Force (RCAF) and later the Canadian Armed Forces (CAF) until it was replaced by the McDonnell Douglas CF-18 Hornet. 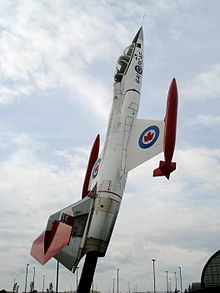 Canadair's internal designation was CL-90 while the RCAF's version was initially designated CF-111, then changed to CF-104. Although basically similar to the F-104G, the CF-104 was optimized for the nuclear strike/reconnaissance role, fitted with R-24A NASARR equipment dedicated to the air-to-ground mode only as well as having provision for a ventral reconnaissance pod equipped with four Vinten cameras. Other differences included retaining the removable refuelling probe, initial deletion of the fuselage-mounted 20 mm (.79 in) M61A1 cannon (replaced by an additional fuel cell) and the main undercarriage members being fitted with longer-stroke liquid springs and larger tires. The first flight of a Canadian-built CF-104 (s/n 12701) occurred on 26 May 1961. The Canadair CF-104 production was 200 aircraft with an additional 140 F-104Gs produced for Lockheed. The CF-104 entered Canadian service in March 1962. Originally designed as a supersonic interceptor aircraft, it was used primarily for low-level strike and reconnaissance by the RCAF. Eight CF-104 squadrons were originally stationed in Europe as part of Canada's NATO commitment. This was reduced to six in 1967, with a further reduction to three squadrons in 1970. Up to 1971, this included a nuclear strike role that would see Canadian aircraft armed with US-supplied nuclear weapons in the event of a conflict with Warsaw Pact forces. During its service life the CF-104 carried the B28, B43 and B57 nuclear weapons. When the CAF later discontinued the strike/reconnaissance role for conventional attack, the M61A1 was refitted, along with U.S. Snakeye "iron" bombs, British BL755 cluster bombs and Canadian-designed CRV-7 rocket pods. Although Canadian pilots practised air combat tactics, AIM-9 Sidewinder missiles were never carried operationally by Canadian Starfighters (however, examples provided to other air forces, such as Norway and Denmark, did carry Sidewinders on a twin-rail centreline station and the wingtip rails). The CF-104D two-seater did not normally carry any armament except for a centreline practice-bomb dispenser. There were 110 class A accidents in the 25 years that Canada operated the CF-104 resulting in 37 pilot fatalities. Most of these were in the early part of the program centering on teething problems. Of the 110 class A accidents 21 were attributed to foreign object damage (14 of which were birds), 14 were in flight engine failures, 6 were faulty maintenance, 9 were mid air collisions. 32 struck the ground flying at low level in poor weather conditions. Of the 37 fatalities 4 were clearly attributable to systems failures, all of the others were attributable to some form of pilot inattention. The accident rate of the 104 compares favourably to its predecessor, the F-86 Sabre. In only 12 years of operation the F-86 had 282 class A accidents with a loss of 112 pilots. The Sabre was also a simpler aircraft and was normally flown at higher altitude. The CF-104 was nicknamed the "Widowmaker" by the press but not by the pilots and crews of the aircraft. David Bashow states on page 92 of his book "I never heard a pilot call it the Widowmaker". Sam Firth is quoted on page 93 in Bashow's book "I have never heard a single person who flew, maintained, controlled, or guarded that aircraft of any force (and that includes the Luftwaffe) call it the Widowmaker". The pilots did refer to it, in jest, as the "Aluminium Death Tube", "The Lawn Dart" and "The Flying Phallus" but generally called it the 104 (one oh four) or the Starfighter. Low level attack runs in the 104 were done visually at 100 feet AGL and at speeds up to 600 kn. Low level evasive maneuvers could increase speeds to supersonic. The 104 was very difficult to attack owing to its small size, speed, and low altitude capability. Dave Jurkowski, former CF-104 and CF-18 pilot is quoted "Because of our speed, size and lower level operations, no Canadian Zipper driver was ever 'shot down' by either air or ground threats in the three Red Flag Exercises in which we participated." The CF-104 was very successful in operational exercises held by NATO. The Canadians first took part in the AFCENT Tactical Weapons meet in 1964 and did so every year after that. This meet was a competition between squadrons from Belgium, France, Germany, USA, Britain, and the Netherlands. Scores were based on several factors. Bomb accuracy, time on target, navigation, mission planning and aircraft serviceability. Pilots were chosen at random from the various squadrons to accurately represent operational capabilities. 1964: (first participation) Best team went to the 2 Canadians taking part. 1965: Best Nation went to the Canadians, Top individual score went to F/L Frioult of 427. 1966: RCAF was second best Nation, Top individual score went to F/L Morion of 421. 1970: Canadians were 1st in strike event. 1978: The meet was renamed the Tactical Air Meet the scoring was marred by squabbles and announced a tie. 1980: The Canadians did "well"
1982 onward: the meet was changed to a non-competitive setup. A competition between NATO squadrons with cat mascots. In the late 1970s, the New Fighter Aircraft program was launched to find a suitable replacement for the CF-104, as well as the McDonnell CF-101 Voodoo and the Canadair CF-5. The winner of the competition was the CF-18 Hornet, which began to replace the CF-104 in 1982. All of the CF-104s were retired from service by the Canadian Forces by 1987, with most of the remaining aircraft given to Turkey. Single-seat fighter-bomber version for the RCAF. Two-seat training version for the RCAF. On 22 May 1983, during an airshow at the Rhein-Main Air Base, a Canadian CF-104 Starfighter crashed onto a nearby road, hitting a car and killing all passengers, a vicar's family of five. The pilot was able to eject. CF-104 on display at the Air Force Museum of Alberta, located within The Military Museums, in Calgary, Alberta, Canada. CF-104 and CF-104D RCAF 104756 and 104641 - Canadian Warplane Heritage Museum in Hamilton, Ontario. 104756 is in Tiger Meet colours. This aircraft was originally 12790. CF-104 Turkish Air Force 63-893 on display at Szolnok Aviation Museum in Szolnok. CF-104D RNoAF 730 - Displayed at the Sola Air Museum in Stavanger. CF-104 RNoAF 755 - At Kjeller, Lillestrøm. CF-104D RNoAF 766 - Displayed on pedestal in front of Kjeller Air Station, Lillestrøm. CF-104 RNoAF 801 - Displayed at the Norwegian Air Museum in Bodø. CF-104 RNoAF 836 - Given to Bardufoss High School. Displayed outside Bardufoss Air Station. CF-104 RNoAF 882 - Displayed as gatekeeper at Volvo Arero Norway, Kongsberg. CF-104 RNoAF 886 - Privately owned at Rudshøgda, Hamar. CF-104 RNoAF 889 - At Torp Airport, Sandefjord. CF-104D cn. 104 637 has been restored to flight condition by a group of volunteers called Friends of Starfighter, and is based at Bodø in Norway. CF-104D, Canadian Armed Forces 104632 - based at Starfighters Inc in Cape Canaveral, Florida. CF-104D, Canadian Armed Forces 104633 - operated by private owner under the company Fuel Fresh Inc. in Phoenix, Arizona. CF-104G, Canadian Armed Forces 104759 - based at Starfighters Inc in Cape Canaveral, Florida. CF-104G, Canadian Armed Forces 104850 - based at Starfighters Inc in Cape Canaveral, Florida. ^ The McDonnell F-4 was never considered although many sources have listed it as a contender and the RCAF's preferred choice. ^ Canadair eventually built a total of 600 wing, tail and fuselage sections. ^ "Historical Listings: Turkey, (TUR) Archived 2013-11-05 at the Wayback Machine."] World Air Forces. Retrieved: 10 June 2011. ^ Canadian Wings (2012). "Canadair CF-104 Starfighter". Retrieved 7 January 2014. ^ Canadian Warplane Heritage Museum (2014). "Lockheed CF-104D Starfighter". Retrieved 7 January 2014. ^ a b Bashow 1990, p. 8. ^ McIntyre 1985, p. 6. ^ Baugher, Joe. "Canadair CF-104 Starfighter." American Military Aircraft, 6 October 2003. Retrieved: 1 May 2011. ^ a b Pickler and Milberry 1990, p. 186. ^ Stachiw 2007, p. 30. ^ Greenhous and Halliday 1999, p. 152. ^ John Clearwater (1998). Canadian Nuclear Weapons: The Untold Story of Canada's Cold War Arsenal. Dundurn Press. pp. 91–116. ISBN 1-55002-299-7. Retrieved 19 December 2016. ^ a b c d "Nato Tiger Meets". www.NatoTigers.org. Archived from the original on 2014-07-04. Retrieved 2014-06-17. ^ Richardson, W. John and Tim West. "The Canadair CF-104." Archived 2015-05-09 at the Wayback Machine ejection-history.org, 2010. Retrieved: 21 March 2011. ^ "Lockheed F-104A Starfighter." Aviation.technomuses.ca (Canada Aviation and Space Museum), 4 March 1954. Retrieved: 6 January 2013. ^ "Canadian Starfighter Museum". Canadianstarfightermuseum.ca. Retrieved 2014-04-19. ^ "CF-104 Starfighter - Atlantic Canada Aviation Museum". ^ "CF-104 "Starfighter" - Saint-Jean-Sur-Richelieu, Quebec". roadsideattractions.ca. Archived from the original on 13 October 2016. Retrieved 22 June 2016. ^ National Air Force Museum of Canada. "Starfighter". airforcemuseum.ca. Retrieved 2 June 2017. ^ "Lockheed Starfighter." Archived 2009-02-27 at the Wayback Machine Comoxairforcemuseum.ca (Comox Air Force Museum). Retrieved: 6 January 2013. ^ "Canadair CF-104 Starfighter." Warplane.com (Canadian Warplane Heritage Museum). Retrieved: 6 January 2013. ^ "Lockheed CF-104D Starfighter". albertaaviationmuseum.com. Archived from the original on 10 January 2017. Retrieved 5 July 2015. ^ "Lockheed CF-104 Starfighter." The Canadian Museum of Flight via Canadianflight.org, 20 June 2008. Retrieved: 5 August 2013. ^ "CF-104 104785" Formerly the pedestal mount at CFB Baden-Soellingen. ^ "F-104G (CF-104G), gift of the Turkish Air Force." repulomuzeum.hu. Retrieved: 17 February 2008. ^ "CF-104." (Norwegian language). Archived 2008-11-02 at the Wayback Machine Sola Museum. Retrieved: 22 October 2008. ^ NRK. "Her flyr Eskil "The Widowmaker" for første gang på 33 år". Retrieved 2016-09-29. ^ "N-Number Inquiry Results Registration N104RB Serial number 104632." Federal Aviation Administration, Retrieved: 18 October 2018. ^ "N-Number Inquiry Results Registration N104 Serial number 104633." Federal Aviation Administration, Retrieved: 18 October 2018. ^ "N-Number Inquiry Results Registration N104RN Serial number 104759." Federal Aviation Administration, Retrieved: 18 October 2018. ^ "N-Number Inquiry Results Registration N104RD Serial number 104780." Federal Aviation Administration, Retrieved: 18 October 2018. Bashow, David L. Starfighter: A Loving Retrospective of the CF-104 Era in Canadian Fighter Aviation, 1961-1986. Stoney Creek, Ontario: Fortress Publications Inc., 1990. ISBN 0-919195-12-1. Francillon, R. J. Lockheed Aircraft Since 1913. London: Putnam, 1987. ISBN 0-370-30329-6. Greenhous, Brereton and Hugh A. Halliday. Canada's Air Forces, 1914–1999. Montreal: Editions Art Global and the Department of National Defence, 1999. ISBN 978-2-92071-872-2. McIntyre, Robert. CF-104 Starfighter (Canadian Profile: Aircraft No. 1). Ottawa, Ontario: Sabre Model Supplies Ltd., 1985. ISBN 0-920375-00-6. Stachiw, Anthony L. CF-104 Starfighter (Aircraft in Canadian Service). St. Catharine's, Ontario: Vanwell Publishing Limited, 2007. ISBN 1-55125-114-0. Wikimedia Commons has media related to Canadair CF-104. This page was last edited on 1 April 2019, at 18:22 (UTC).